Thirteen suspects are in Police custody for allegedly burning down a house of a resident of Kivumu Sector in Rutsiro district. According to reports, Jean Bosco Sibomana, a resident in the area, was attacked and his house burnt down. His livestock was decimated including, pigs, chicken and a cow. The cause of this inhuman and malicious act was precipitated by rumours that his wife identified as Claudine Mukamanzi had allegedly poisoned a family member of a neighbour. Police is said to have intervened although the victim’s house and all the livestock had already been destroyed. So far 11 men and two women are detained at Kivumu Police Station pending investigations. Seven of them were arrested on Thursday, July 5, while the other six were arrested today, Friday. On Tuesday, July 3, one Bosco Hakizimana, a resident in Kabuye Village, Kabujenje Cell, Kivumu Sector of Rutsiro District, is said to have developed sudden chest pain. He cried in agony and fell down. Hakizimana started trembling and began suffocating. Rumours started circulating that the sudden failure of Hakizimana’s health was caused by Mukamanzi, who is accused of sending evil spirits (‘Ibitama’) to attack Hakizimana. According to Prosper Ntaneza, the leader of Kabuye village, Bosco Hakizimana, 24, had been living in Kabuye village of Kabujenje Cell for a year. He had relocated there from Nyabirasi Sector, neighbouring Kivumu Sector, after he bought a plot in which he built a house he lived in with his wife. Hakizimana was a newlywed and his wife is now expectant of their first born. After it was said Hakizimana was attacked by the “Ibitama” spirits, his family members from Nyabirasi Sector came and ambushed his neighbour Jean Bosco Sibomana and started beating him with his wife Mukamanzi on Tuesday. Hakizimana’s house is in a 20-meters distance from Sibomana’s. Neighbors alerted, DASSO officers operating at Kivumu Sector’s office and the local authorities who intervened and prevented the men from continued beating of the couple. However, the man’s situation worsened on Wednesday and he was taken to Kivumu Health Centre where he was treated, but he could not show signs of recovery. He was later in the evening taken to a traditional healer, known as an expert to cure the ‘ibitama‘ in Kigeyo Sector, but he couldn’t recover and passed away on Thursday at 3PM. Learning of the death of Hakizimana, Jean Bosco Sibomana and his wife, Claudine Mukamanzi, the brother to the deceased, fled with their two children. Full of anger over their family member’s death, men from Nyabirasi, the sector of birth of Hakizimana, came to revenge equipped with crude weapons including sticks and machetes. They demolished Sibomana’s house, killed his cow, a pig and 11 hens. They also destroyed and burned to ashes the property inside the house including maize and clothes. Police arrived at the crime scene an hour later. They arrested seven people at the scene. Among the arrested is Jean Bosco Bizimungu, an elder brother to Jean Bosco Hakizimana. After being handcuffed, Bizimungu was heard saying, “I’m not bigger chested than my brother who was killed, arrest me”, pleading innocence. The investigation is still under way and the body of the deceased was taken to Gisenyi Hospital for an autopsy. It required the intervention of the authorities of Rutsiro District for the family members of Hakizimana to accept to take his body to hospital for autopsy. They couldn’t afford the money for the autopsy. 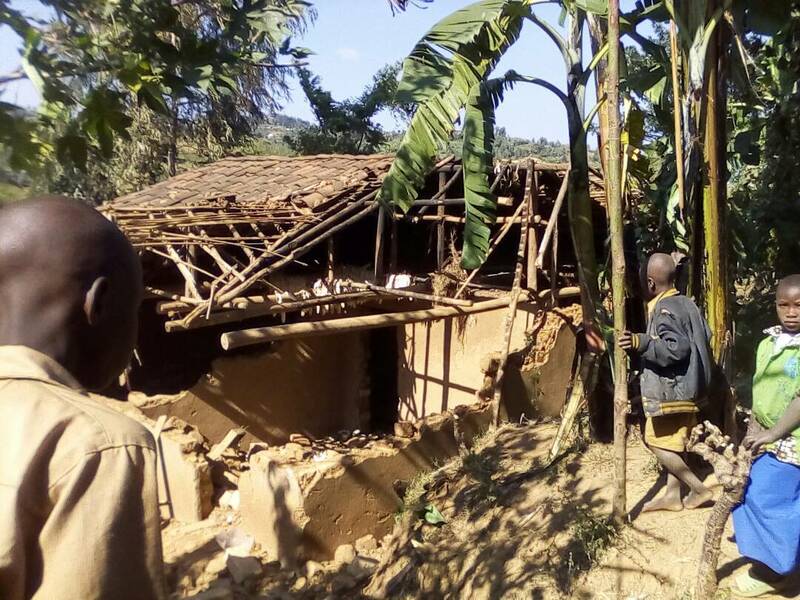 Meanwhile, on Friday evening, the family whose house was destroyed was found after several phone calls as they were assured full protection by the authorities of Kivumu Sector. They have now been provided with a temporary shelter at Kivumu Sector office.